My retirement has given me the opportunity to branch out in various creative endeavors, some of which I have done before but in a limited way, others I have never had the time to try, and still others whereby I expanded what I had been doing over the years. My mother taught me how to sew and my grandmother taught me how to knit and crochet. Even in the early years of marriage, as we struggled with trying to make ends meet, we chose not to have me working but to be home with the children. This made these handcrafts an imperative. I sewed clothes for myself and for my children, drapes and slip-covers, all on a 1928 treadle Singer sewing machine that only went forward (it was hard turning around all the material in a sofa slip-cover in order to get stitching backwards, but one could sew if the electricity went out.) And I made numerous knitted things for my husband as well as the children and myself. All very practical; all a part of ‘making do’. But with retirement I started a quilt for my granddaughter which I had to stop because of problems with my eyes not seeing well enough on the dark-colored material of dolphins and whales in the ocean. What could I still sew? Then I remembered the Memory Bears made by a volunteer while I was working in hospice. 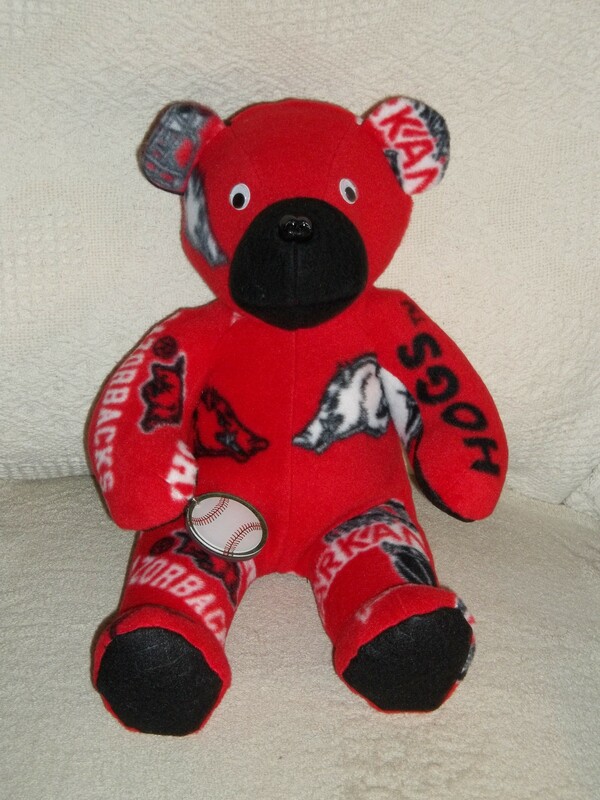 I used that pattern and made a University of Arkansas Razorback Bear for my teenage grandson. The picture above is the Bear holding a baseball key chain. 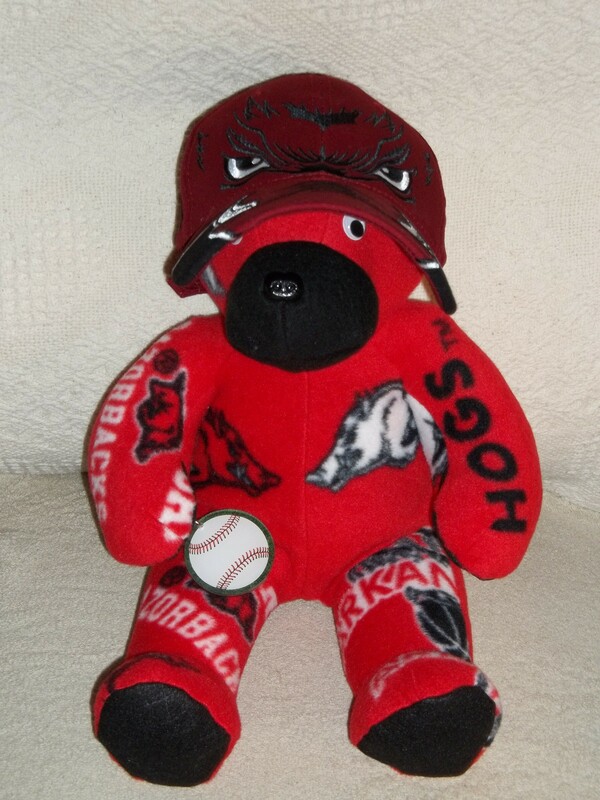 The one below is the Bear wearing a University of Arkansas (hoghat) baseball cap on. Needless to say, he loved the Bear and its accessories, particularly the ferocious looking baseball cap. Time had moved on in many ways: one was I no longer had the 1928 treadle Singer sewing machine but did have one which sewed both forwards and backwards, which was a great help. Another, I was sewing something for my grandson, not my children. And yet another, I was doing this because I wanted to, not because I had to. Time keeps moving on. This last year has been one of slithering through many changes; experimenting with many art/writing forms; making a variety of projects with various art/word combinations. It has been a wonderfully creative and explorative year as I shed one form of creativity to take on another, then shed that – or more accurately, merge that with all the others I’ve done and will do. 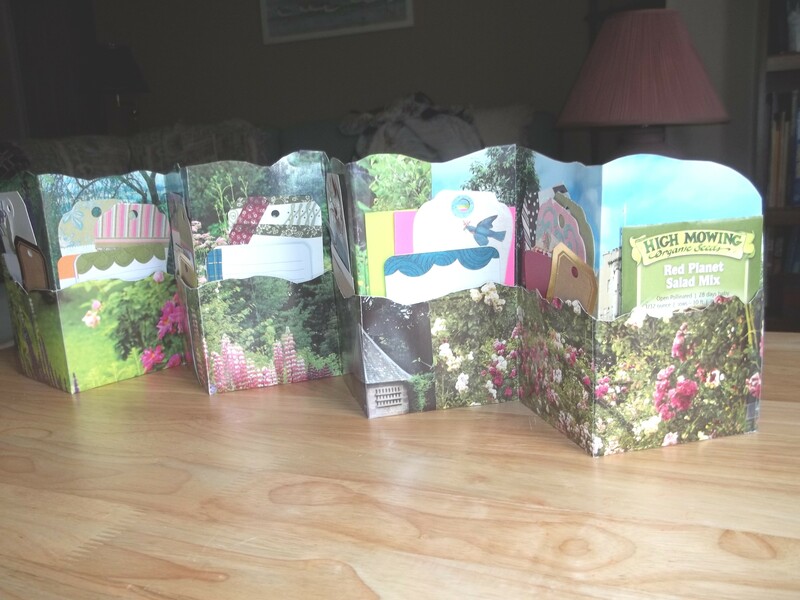 One of my projects involved using 2 beautiful pages from an old garden calendar to make an accordion journal in which to keep seed packets, an assortment of pretty notes and cards to jot down ideas about the garden, etc. This easy to make and a delight to my eyes garden journal was a gift to a friend who appreciates her garden and loves to keep details of what happens when in her garden. I found that I loved looking at it more than I could picture using it in any way other than for visual delight. I’m too much the get-your-hands-dirty big picture person rather than the wear-gloves detail oriented person in the garden. I taped 2 calendar pages together, pasted 2 more taped pages turned upside down onto the first set. Then I folded up one side about 1/3, taping edges to hold flap in place. Then accordion pleat the entire length, cutting off wherever necessary to come out with evenly spaced pages/pockets. Free-form cut the top of the pages and the pockets in accordance with placement and design. 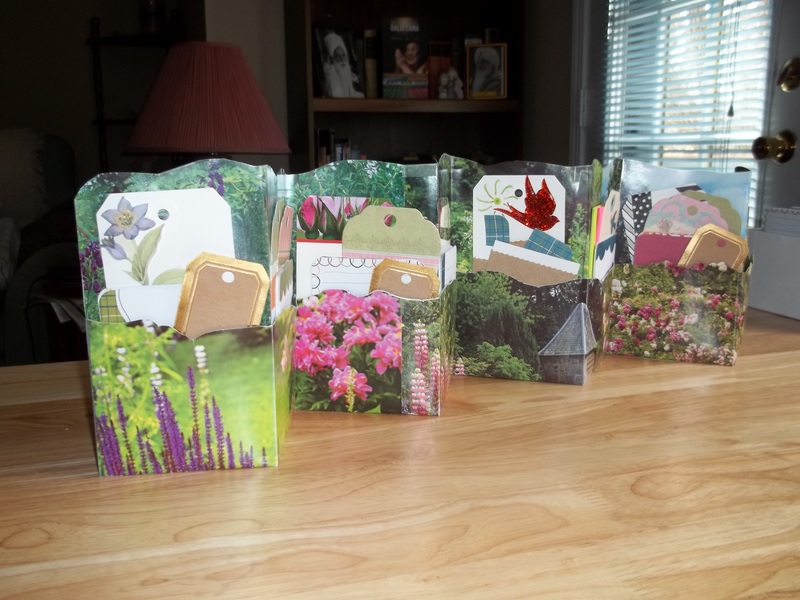 Then I started adding various notes and cards I decorated with washi tape, stickers and drawings. This was a fairly quick and easy project that was perfect for anticipating spring and working in the garden. And one I will probably do again for myself – for visual enjoyment and for – who knows what idea might spring up?